We want our MTV – I mean – ECV! Walt Disney World Resort has selected five featured vendors that have agreed to rent resort Guests only those Electric Conveyance Vehicles (ECVs) that, based on size and speed, have been determined safest for use in the theme parks, resort hotels and transportation system. Disney will recommend the featured vendors to our Guests and allow them to drop off and pick up their devices at our resort hotels, without the need for Guests to be present. All other vendors will have to arrange drop off and pick up directly with Guests and will not be able to leave the devices unattended. This process will be implemented across all resort hotels beginning on November 1, 2012. I adore my father-in-law. He smiles when I call him my FAVORITE father-in-law, since he’s the only one I’ve ever had. He really is one of the most terrific people I have ever known. Brilliant business man, cigar aficionado,Yankees fan, lover of all great music – (including Sinatra AND disco! ), husband to his wife for over 60 years, embracer of laughter and life…and my favorite thing of all…he is a wonderful adviser and best friend to my husband. Just like some other seasoned, mature folks however, my favorite father-in-law also happens to have mobility issues. I love his company and I have wanted to take him to Disney World with me for years. I keep hoping to talk him into it one day. Out of curiosity – I started looking into the options Disney has regarding electric convenience vehicles – or scooters as we locals like to call them. Not that he’d really need or want one – but I thought it would be nice to give him the option. I am hoping maybe you can benefit from some of my research on the subject. I threw in some wheelchair and stroller information too. While you wait for your brochure to arrive however, here are some tips to help you start planning. Please keep in mind that in all of these locations – Disney REALLY stresses that vehicles are available on a first come first serve basis and of course – they are not free. For more information, ask for the Guidebook for Guests with Disabilities at any of these locations. 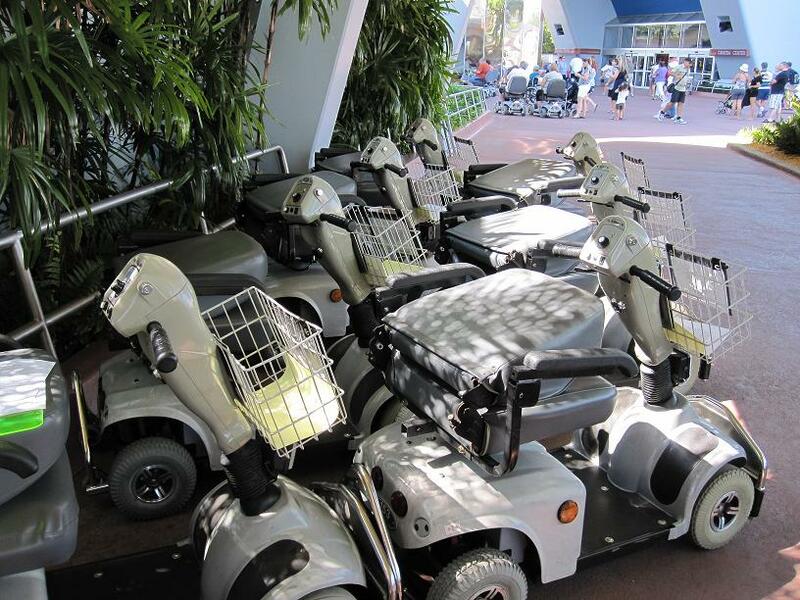 Wheelchair and ECV rentals are available at the Stroller Shop inside the Magic Kingdom theme park entrance. Wheelchair and ECV rentals are available on the east side of the Epcot theme park Entrance Plaza and at the International Gateway. For more information, ask for the Guidebook for Guests with Disabilities at Guest Relations on the east side of Spaceship Earth. At HS you will want to check with Oscar’s Super Service near the main entrance. Guests visiting Disney’s Hollywood Studios are able to rent strollers (single or double), manual wheelchairs, or electric scooters in this location. Replacement wheelchairs are available at the In Character Costume Shop. AK has ECV Rentals located in Garden Gate Gifts near the main entrance. Guests visiting Disney’s Animal Kingdom Park are able to rent strollers (single or double), manual wheelchairs, or electric scooters. Rentals are subject to availability. There is information to suggest there may be ECVs to rent, as well as strollers, and wheelchairs, located between Tren-D and Once Upon a Toy near the restrooms. However, when I called Disney, the operator on the line told me they do not rent them there. Not that I doubt – her but I am still curious and want to find out the whole story. I guess I will have to make a research trip myself to find out for sure. Anything for my Disneyways readers! Aw, who am I kidding. It’s all about feeling the wind in my hair on the new Dumbo ride. Wheelchairs are welcome at Disney’s Typhoon Lagoon Water Park and Blizzard Beach; however, they are not available for rent. No ECVs available at either. A limited number of wheelchairs (not ECV’s) are available at each Disney Resort Hotel. A $315 USD deposit will be held on the Guest room account—charged only if the wheelchair is not returned. Each of these locations have opening and closing hours that tend to vary, as well as an additional cost for rentals. You will want to check with Disney directly for details. On your next call perhaps, Disney will refer you to the area rental companies such as those listed below. Another GREAT source of info (and the first place I thought of in my search) is www.disneyonwheelsblog.com. And from theinfomouse.com – here are tips on your first visit. Do you or a loved one have experiences you’d like to share regarding strollers, wheelchairs or ECV rentals at Walt Disney World? ← Tour the new Fantasyland in pictures! My sister in law turned her ankle badly on our trip last year, and we ended up renting an ECV for the last 2 days. Best money ever spent! She was so much more comfortable and we even got on one or two rides a tad faster through the wheelchair entrances. Disney is the place for anyone with any kind of disability (even a temporary one!) and the cast members went out of their way to help us navigate the ECV and lines, restaurants, and crowds! Such great research and helpful information! Not to mention your touching and heartwarming description of a very special person!